Scoplevel folds down when not in use. It is made with super-tough reinforced vertron. Scoplevel has a full money back guarantee. Scoplevel is easy to install. It has integral rings, screws and Allen wrench. It comes in two models to fit all standard scopes, one inch or 30 mm. Scoplevel is much more than just a great Anti-Cant device. 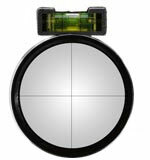 It can be used to perfectly align your rifle's scope to the bore. The shooter can see the level above the vertical crosshair with the sighting eye while aiming and verify that the vertical crosshair is plumb. If your scope is aligned correctly to the rifle, your bullet impacts will follow a vertical line above the point of aim through the entire range of vertical adjustment, and group on the vertical line at maximum elevation. Fig. #1. If your bullet impacts miss the vertical line it indicates the scope is not aligned to the bore. Fig. #2. Simply mark a vertical line on your target using a level. Using your Scoplevel to verify that your vertical crosshair is perfectly plumb and using the bottom of the plumb line as an aiming point, shoot a group to verify zero. Elevate your scope's vertical adjustment several minutes of angle between each shot until you reach maximum adjustment and shoot a group. If your target looks like Fig #1. you are done. Your scope and bore are aligned and you are ready for some serious long range shooting. If your target looks like Fig. #2., let's fix it. Loosen the screws clamping your scope tube and slightly rotate your scope tube in the direction of the group. (If the group is to the right, rotate the scope tube clockwise.) Re-tighten the screws and fire another group. Repeat as necessary until your impacts look like Fig. #1. Then you will be ready for some serious long range shooting.